5 January 1823 – 190 years ago today – marks the death of another important figure in the early days of the young colony: Lieutenant George Johnston. Johnston, who was born in Annan/Scotland, came to New South Wales as an officer of the First Fleet. 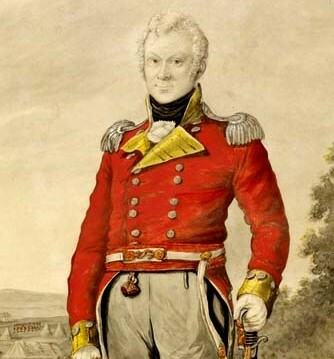 He served as adjutant to Governor Phillip, rose through the ranks and finally led the mutinous forces that disposed of Governor Bligh in that famous Australian coup d’etat called the Rum Rebellion in 1808. When order in the colony was re-established, Johnston was court-martialled in England for mutiny, but only received a quite lenient sentence. Presumably, the court regarded his involvement as being driven by other forces rather than of his own motivation. He returned to Sydney where he owned several large tracts of land, including today’s Inner Western suburb of Annandale (named after his Scottish birthplace). In the 1990s I actually used to live in Johnston St, where the gates to his property are still part of the public schoolgrounds. Originally buried on his own property, Johnston’s grave was later moved to Waverly Cemetry where his mausoleum overlooks the Tasman Sea.